Muslim Brotherhood threatened that on Friday, the 30th of August 2013, Egypt and the whole world are going to watch at least 50 Million Egyptian all over the country in the 28 Cities of Egypt, demonstrations and gathering that History has never seen before! That was the Brotherhood claim! What happened on the real ground on 30/8/2013, Brotherhood supporters demonstrated in only 9 Egyptian Cities out of 28 total cities! Beni Suef about 3000 – Ismailia about 2000 – Port Said about 2000 – Al-Mansoura about 700 – Sharqia about 2000- Suez about 2000- Red Sea about 300 – Alexandria about 2000. So the total of the 9 cities demonstrators is about 14000. In Cairo, Brotherhood demonstrated in different areas, but there is no exact figures that I can rely on, because in some areas we saw 30 people, in other areas from 100 to 500 or 1000 but they were mostly very few to count and get even an about total figures. 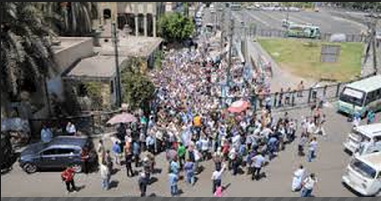 Please Put into consideration that the Egyptian Population is about 87 Millions at this minute as we speak. Link of Brotherhood and Al-Jazeera Channel of Qatar’s lies and fake news about the Brotherhood demonstrations in different area in Egypt. One may say, aren’t those MB supporters have the right to demonstrate and express their opinions? Of course they have that right as long as they demonstrate peacefully and not to demonstrate like what happened on 30/8/2013 : with weapons, machine guns and committed terror acts against civilians, military, police, killed and injured people, attacked vital official buildings and damaged public and private properties! Let me also remind you of something important, if on the 30th of June 2013, the Egyptians who made the revolution, about 40 million Egyptian demonstrators in the whole country against the MB regime, were not millions then, but were about the same figures of 30.000 or less or even a little bit more, would any country in this whole world admit then that it was a real revolution representing the majority of Egyptians and the Egyptian Government should act according to what those demonstrators say?! I don’t think so! We are watching daily now the exact plan of raising the death toll in Egypt like in Syria and Iraq to reach 6000 Egyptian Casualties daily as that documented report link mentioned in addition to the US and their Allies Plan of the ” Immobilization of Egypt” in all respects. 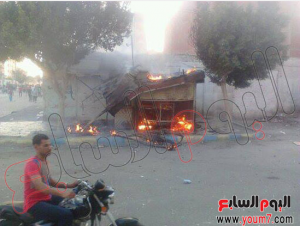 The Ministry of Health announced more than 6 Egyptians killed and 190 injured as total Casualties on 30/8/2013. The Ministry of Interior declared that since 14/8/2013 till today 31/8/2013: 1091 Police Officers and Soldiers got killed and 978 injured. Brotherhood did not respect the Curfew which started at 7:00 evening, and not only they were making chaos in the streets, but they were also terrorizing people who were staying at their own homes. 2 Videos dated 30 August 2013, showing the MB supporters attacking Al-Nozha Al-Gadida Police Station in Cairo with machine guns. Eye Witnesses said every thing happened suddenly when a car stopped in front of the Police station, headed to the police station and started to shoot randomly which caused the death of a police officer and the injury of another police deputy. It also caused the death of a labor who happened to be by the chance in front of a building which faces the police station – the labor was moving furniture to the building, when he saw the killers shooting, he tried to escape by taking the ground floor’s stairs of the building, but the shooters shot him intensively while he was climbing the stairs. On 30/8/2013, the following video shows Police individuals who eye witnessed the arresting of some Brotherhood supporters on the Saft Bridge Giza City, while they were having some cartons with 24 Bombs made of screws. 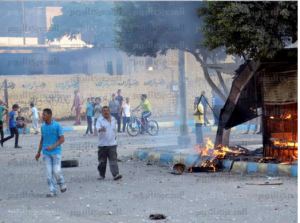 The MB supporters were planning to place the Bombs on the Bridge. Bombs experts managed to nullify the effects of the Bombs. In the same area of Bolak Giza, MB supporters tried to break into Bolak Police station in Giza, the following video shows the degree of damages caused by MB Supporters to the police station, they used different kinds of weapons and bombs made of screws. The video shows the police cars smashed and damaged out side the police station and the damages caused to the police station also due to the firing with live shots from MB supporters and also the Screws bombs that the MB supporters used against the police station. Video, Metro Subway in Cairo, Brotherhood supporters attacked the private wagons for Women and terrorized them. 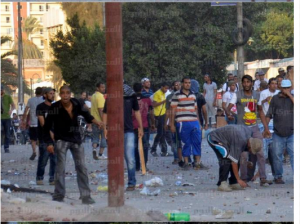 In Port Said City – 30/8/2013 – Aswan and Adel El-Sherbeeny streets – MB supporters attacked civilians with weapons and live bullets were shooting randomly at people after the Fridays prayers- One was shot dead with a bullet in the head his name is Hany Alsayed Alaraby 36 years old – Another two civilians in a very critical conditions Ahmed Mohammed Al-Atreby had shots in both legs and Abd El-Rahman Hamza reached Damietta Hospital with a shot gun in the neck. 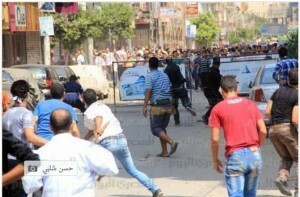 – The total casualties in Port Said: One got killed and 18 injured. 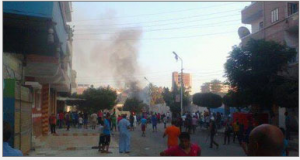 In Port Said also Islamists Militia attacked Abu Seifein Church in Port Said on 30-8-2013, two terrorists stopped by the church and started to shoot randomly at the Church and at the military forces who were securing it. Eye Witnesses testified that they were riding a Motorcycle with no plate licence – 4 people got injured including two soldiers. In Al-Arish City – Sinai – 30/8/2013 – Lieutenant Police Martyr Zein Al-Abedin Mostafa Fouad got a shot in the chest by MB militia which caused his immediate death – in AlArish Sinai 30 August 2013. Video and screen shot OnTv Egyptian Channel – The whole team of OnTv and the Camera man got attacked by MB supporters while recording their demonstration – 30/8/2013 in Mohandessin Area Cairo – Sherif Samir – Brotherhood supporters attacked him and caused him skull fracture. They also damaged the Car and broke the Camera and the Equipment. In Al-sharqiya City, an Egyptian citizen was shot dead and 18 got injured including 3 cases badly injured and in critical conditions due to the MB attacks against Civilians in different areas in the City. 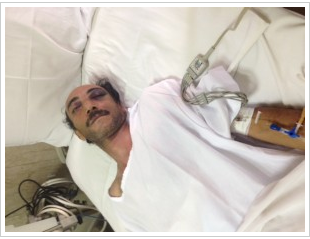 critical injuries moved to Al-Zakazik Hospital. In Dkahlia City – 30-8-2013 – 11 people got injured due to MB supporters attacks – a civilian was killed with a bullet in the head due to the random shooting by Morsi’s supporters, his name is Sherif Taha Al-Amash 40 years old – also General Ahmed Adel-Gendy Assistant of the Director of security got injured by Brotherhood Militia who caused a deep cut injury in his head – Police arrested 80 Brotherhood supporters who were terrorizing people and shooting randomly in the streets. In Al-Menia City – 30/8/2013 – Brotherhood supporters attacked and damaged many shops in the city and they were using guns – but the people managed to force them to disperse after they gathered against them and arrested some of those MB supporters who damaged their shops and were carrying guns, and handed them to the security forces. 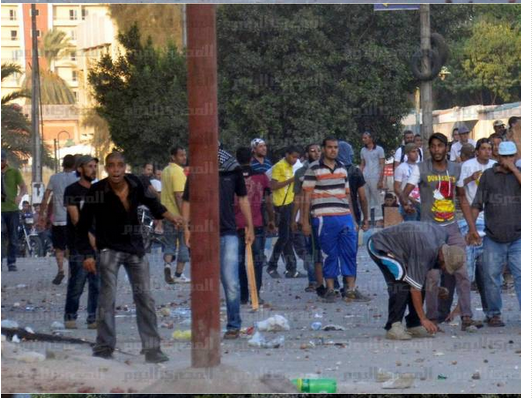 In Tanta City – 30/8/2013 – Brotherhood supporters were terrorizing people in different areas in the City and damaging private cars and properties – Police forces used tears Gas and managed to disperse them. In Alexandria City – 30/8/2013 – People managed to disperse Brotherhood supporters who were shooting randomly in Al-kaed Ibrahim Area – Police arrested 5 persons who were armed and the people also in the neighborhood helped the police in arresting MB armed supporters. In Behera City – 30/8/2013 – 6 civilians got injured and were moved to Damanhour Hospital due to Brotherhood attacks against Civilians and also 3 People got injured in Delengat area due to brotherhood supporters violence acts against Civilians. 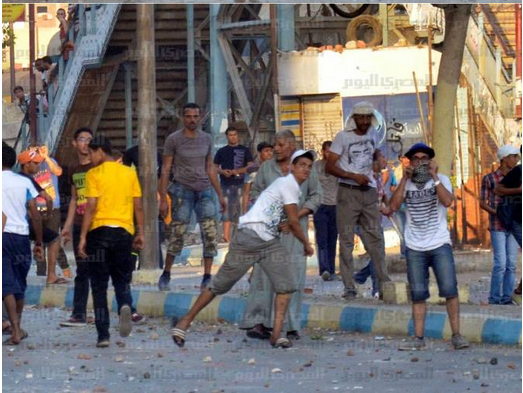 Brotherhood supporters on 30/8/2013. cutting and blocking the streets in Roxy – Heliopolis area – standing in the middle of the roads and not allowing any cars to move. Military forces in Sinai managed to arrest 31 terrorists who belongs to different Islamist Extremist Armed groups who were involved in killing Military and Police Officers and Soldiers in North Sinai – and also attacking vital official military camps and buildings with heavy weapons and missiles in North Sinai – 31 August 2013 – Also among those terrorists there are many Palestinians who belongs to Hamas and Africans recruited by Terrorists Groups. Video 31/8/2013 Police arrested a student carrying a bomb before placing it on one of the bridges in Al-Mansoura City. The Boy in the video said my name is Ismail Youness, I’m a student – A man that I know his name is Ismail Refaat, and he is a Brotherhood member told me that he wanted me and 4 others of my friends to go to a specific address to meet a guy who’s name is Dr. Mahmoud and he will give each of us 100 L.e. and 5 bombs to place them on one of the bridges in Al-Mansoura City. My friends and I took the bombs and we agreed to meet by the targeted Bridge, when we were proceeding the placements of the Bombs, we saw some policemen passing in the street, my friends ran and I got caught by the police. Video dated 30/8/2013 showing a police officer got injured by a live bullet in his face shot by MB supporters in Mohandessin Area. He said thank god the bullet went close to my cheek and ear and didn’t go any closer. Another Scandal of Aljazeera fake news – An Egyptian Citizen recorded from his balcony which has a total view on Mohandessin Brotherhood Demonstrations in Sphinx Square, and show Al-Jazeera Channel fake pictures and Videos – Big Scandal for Aljazeera who always fake videos and news of Brotherhood demonstrations, all the time – you will see at the same minute what Al-Jazeera is showing and What that Citizen is showing from his own balcony filming the same square at the same minute ALJAZEERA was Broadcasting LIVE!. Aljazeera showed demonstrations in all cities including where the Citizen lives. The whole world watched the Brotherhood demonstrations on 30/8/2013 – Aljazeera also claimed that millions of brotherhood supports are demonstrating in all the cities! 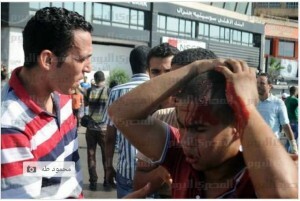 The video shows how the Police and the Military forces are dealing with MB demonstrators. In Mohandessin Area, the military officer is talking to MB demonstrators, advising them not to go closer to where the security forces were standing, and not to cross the barriers. He was asking them to act accordingly because it is the security forces duty to save their lives and protect them from breaking the law and that no soldier will fire any tear gas at demonstrators as long as respect the law. Officer also added that MB are their brothers and living in the same country, so let’s all respect the law and save our country. Some of The MB supporters as the video shows,were challenging the security forces and were moving forward and were insulting the security forces and threatening them, while some of MB supporters respected what the officer said and tried to move their colleagues away. Brotherhood supporters Video 30/8/2013 Nahia Bridge area Giza , showing Brotherhood supporters carrying metal, wooden sticks and swords. The Camera man and Eyes witnesses mentioned that while they were watching the Brotherhood supporters, they heard a shooting which sounded like machine guns but they were not able to tell about further details, because they kept their head down, the minute they heard the shooting. Video dated 30 August 2013, showing an MB supporter who was participating in the attacking with other MB supporters against police and military forces in Mohandessin Area Cairo and they were also damaging private properties and terrorizing civilians in the area – Police arrested him and while walking, the MB supporter was telling the police, that he is under drugs and he has nothing to do with Brotherhood. So the policeman asked him, if he has nothing to do with the other MB supporters who were committing violence, how come he was participating in violence acts with them? So he said that he really can’t tell how MB managed to get him in there! 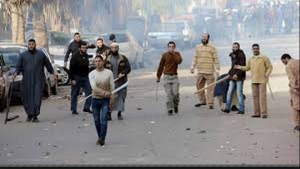 Video, another MB favorite chanting is that one of threatening all Egyptians that USA and Europe will invade Egypt and defeat the Egyptian Military and kill all Egyptian People traitors who betrayed the Muslim Brotherhood and Mohammed Morsi. They also were addressing their speech in English to Obama calling him and urging the US Military to come and invade Egypt. 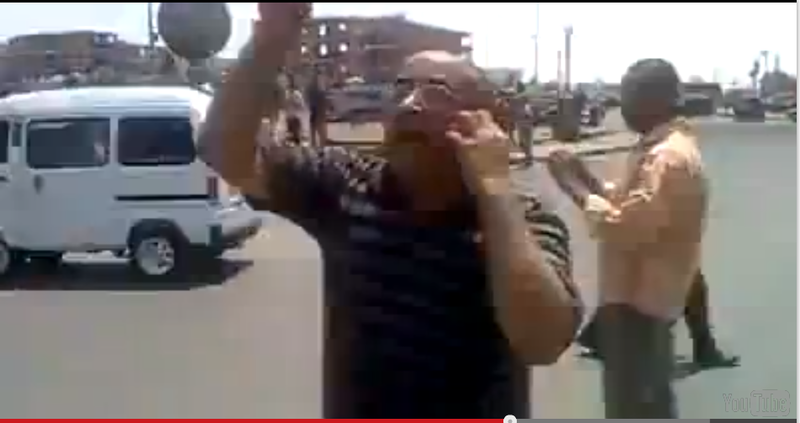 That video dated 9/7/2013 before the disengagement of Rabaa square on 14/8/2013. This is just for the record!